Consultative Selling is about offering a prospect value upfront with no obligation. In Consultative Selling, the seller learns about customer needs and offers a solution before talking service or product. As a digital marketing agency, it’s our job to provide growing businesses with the tools they need to succeed, primarily through web development and digital and inbound marketing. But, like any business, we have to find those potential customers and then have to impress upon them our skills, qualifications, and ability to do a good job for them. We’ve abandoned the traditional “sales pitch” approach in favor of a process where we work cooperatively with potential clients to see if we’re a good fit. It’s called “consultative selling” because we conduct a series of consultations to determine whether or not we would benefit from working with one another. We strongly believe in giving potential clients as much information, strategies, tactics, and guides, as transparently as possible, with no obligation for them to retain our agency’s services. We want all of our clients to fit into our systems and be able to work well with our team, so transparency and openness is a priority. We’ve developed a systematic approach that aligns with our core value of leaving people better than we found them, and believe above all that we need to ensure a good fit first before moving forward. This allows Uhuru to work exclusively with clients based on how they fit into our beliefs and builds a trust that makes us a true partner in their success. That’s right, we choose whom we work with and how we work with them. Download this Guide: Don’t have time to read the entire post now. Download to read later and learn our three-stage process that we use when consulting with prospective clients. Our consultative selling approach gives us the ability to avoid turning our strategy sessions into sales calls. We have a three-stage process that we use when consulting with prospective clients. Some call it our “secret sauce,” but we don’t have any secrets here. We want to share with you just how we work. We think it will be helpful to you, either as a potential client, or to provide you with some insight into how you can conduct, change, or update your own business processes. I’ll break down how we approach and conduct each of the three calls we make with prospects, where we connect with their brand, explore their active strategies, and thoroughly diagnose the areas that need improvement. When you’re done reading this, I hope that you can appreciate the process as we have reinvented it and see how it benefits our relationship with our clients, provides value to them at no cost, and gives them a deeper look into how we would work with them in the future. The definition of consultative selling varies from agency to agency, so let’s look at a few consultative selling examples of our process. Our preliminary, or “connect” call, is all about determining the prospective client’s most obvious needs while making a strong impression that showcases our skill sets and reinforces our expertise. We want our prospect to leave the call with the understanding that our team has what it takes to help their company reach a new level of success. This part should be obvious, but I know too many marketers who go into consultations with the mindset that the initial call is the time to learn about your prospective client. It’s not. We do our research. We understand who we’re talking to and what challenges they face in their market. We make it our business to know their industry and competition. We endeavor to develop a thorough understanding of what they do. We take the time to outline areas where we feel the prospect could improve. Above all, we are prepared. We like to approach a prospect by catching them with their pants down. O.K., so that may sound a bit strange but let me explain. When we target a new company to approach, we take a magnifying glass to their current marketing efforts. Even without any behind-the-scenes access, as marketers we are able to identify a brand’s weak areas, right? We use this information to pique an executive’s interest by pointing out something (or multiple items) they’re not doing as well as they could be. After all, any good executive will want to know more about how they can improve their current marketing strategy (if the delivery is right). The important thing to remember when utilizing this consultative selling approach is to act in a friendly and helpful manner. Coming on too strong with too much information about what they should improve will only serve to alienate a prospect and turn them off. Instead, we open with a friendly offer to talk about their strategy and one or two ways that we feel it can be improved based on our research. We provide examples of what we’re talking about. Our goal is to make sure that we provide value and are their helpful guide, rather than pushing a hard sell about the things that they need to change. Deal closer’s top tip:: When speaking with executives, remember that while it’s their job to deliver the best for their company, they’re still human. If you come on too strong and tell them too much about what they’re doing “wrong,” it’s easy for it to be taken personally. Avoid bruising anyone’s ego, it’s highly counterproductive! We reached out to a pair of execs from a particular fashion brand with two things they could improve upon. They were improvements rather than true problems, and they lined up perfectly with our marketing programs. The first thing we discussed was the issues with their Facebook marketing. The prospective client spoke about how successful they’d found Facebook Ads. They were thrilled about the conversions they were able to generate and the amount of new customers they were able to reach. A Facebook Ad strategy is one of the things we do extremely well, better than just about anyone we know, so we were able to give them a few examples of how their Facebook marketing could be dramatically improved. All the while, we gave compliments to their success and their current position. We wanted them to know they’re doing a good job (because they were), yet understand that there was room for major improvement. Remember, thanks to the success they had already experienced, they were very happy with Facebook as a customer-acquisition platform. Free advice on ways to optimize their efficiency and boost profits was something that they were very willing to listen to. That’s what we used to lead the conversation and get them “hooked.” (Can I use that term without it feeling sleazy?) It’s our belief that we need to provide any and all prospects with more value upfront and with no obligation to hook them and keep them interested in what we have to say. Because typically we know what they can do to increase their marketing performance by 2-10 times. At this point, we were moving in the right direction with the prospect, but we needed to provide them with more value. It’s not unusual for prospects to express a healthy level of skepticism, but we can begin to build trust if we provide them with helpful information during a low-pressure consultation. It was time to address issue number two. Now that we had earned a bit of trust, we were ready to present a few ideas about how they could improve their content marketing. Remember, our consultative selling process is all about honest and transparent communication in order to build a trusting relationship. The level at which they were practicing was fairly elementary, so making improvements wouldn’t necessarily be hard. We just had to deliver our suggestions in a way that they were able to understand functionally and that fit their brand. Here’s an important piece to remember. Just because you are able to make recommendations on how to improve something doesn’t make you valuable. Instead, we have found it best to make it personal with presentations on real-world applications of how to improve particular parts of their strategy. It doesn’t need to be detailed at first. It’s more important to show an understanding of their business and an ability to work in a way that fits with their current systems, as well as their needs as a brand. In consultative selling it’s just as important for us to explain why we would do things the way we recommend. We give them the Cliffs Notes version of why we would choose to operate their marketing in a specific manner. We notice a problem, so we explain the basic principles behind the strategy modifications we would use to solve it. In this case, their content wasn’t receiving much engagement or traffic, so we talked about providing more value to the buyer’s journey. We explained the long-term benefits of this type of investment and the trust between us continued to grow. This prospect in particular was fairly in touch with the marketing principals we were talking about, and we knew that. They appreciated the brief details we shared about why their fashion brand should be focusing on driving more engagement and our experience in helping other fashion brands achieve similar positive results. Deal closer’s top tip:: The length of these calls should be respectful of the prospect’s busy schedule (and your own). For this reason, it’s important to lead the conversation and keep both the prospective client and yourself on track. Spoiler alert: A highly effective consultative selling process all boils down to one thing—questions. In fact, asking the right questions can mean the difference between closing the deal and getting your first call wrapped early. Learning to ask the right questions helps our prospective clients let their guard down, open up, and give us everything we need to show them just how much we can help them. Instead, we’ve refined our definition of leading questions. Our LQs are simply a way of steering the conversation by asking about things pertaining to the topic at hand. As we found ourselves deeper into our consultation with the fashion brand, we began to understand more about their interest in optimizing the brand’s content marketing strategy. We got the conversation started around that topic by asking if they’d had an internal discussion about solving their content issue. This type of questioning provided us with deeper look into the inner workings of their organization. It also got them thinking about their internal needs rather than feeling like they were being told by an outsider about what we thought they should be doing differently. Our consultative selling approach is gentle, and comes from a position of leaving people better than we found them by wanting to help. We wanted to know more so we could help them decide what the best next step was, with or without our team’s help. We asked them about their content and whether they saw it providing more value to the buyer’s journey, a concept they understood very well. We also opened up about our own shortcomings in order to help them feel more comfortable answering these questions. We told them that, as outsiders, we didn’t have a “magic” formula to track the success of their email campaigns and asked them to share their results from their current email strategy. Transparency is a key component to gaining trust and it’s important to us to help our prospects feel as if they are being presented with the full picture instead of just bits and pieces. We explained that we want our clients to look for a buyer’s journey that is understood and documented. I asked them about their site and whether it was filling their funnel with prospects that are interested but not yet ready to buy, as a way to reinforce the importance of a more thorough content marketing strategy. The type of leading questions we were asking allowed us to talk about their competitors’ content marketing strategies and how we felt content should be used by the fashion industry as a whole. This gave us the opportunity to contrast and compare where they were in relation to the frontrunners in their industry. It also gave us a chance to ask questions about areas where they felt they were lacking. Once again, we turned to the brand to give us insight into the way they felt about their ongoing marketing efforts. Initially it makes more sense to help them through the areas they feel insecure about before turning to more recommendations. We put ourselves in a position to help. It doesn’t feel very helpful if we start by telling them what they need to be doing and ignoring their immediate concerns. We recommended creating lead-nurturing sequences that were focused on delivering more value (rather than going for the immediate conversion), which would present them with opportunities to reach a new group of prospective buyers. Once again, our consultative selling approach gave us room to ask deeper questions that provided more insight into their inner processes. Throughout the consultation we want to steer the conversation back and forth between thought-provoking inquisitions and our recommendations to help them solve their problems. It’s a bit like playing the role of “marketing therapist,” because many brands won’t be able to see some of their shortcomings until we take their hand on this journey of self-discovery. Rather than telling them about all of the things we’ve noticed that need improvement, we help them find them on their own. The connect call is all about getting to know the brand we’re targeting and, more importantly, the brand getting to know us. Once we’ve reached a point where we feel both parties are familiar with one another and we’ve set ourselves up as a trusted advisor, we move to wrap the call and schedule the next. We explained that if they took our suggestions and put them into play, it wouldn’t hurt our feelings. We wanted them to understand that we were there to help as needed, and only as long as it was a good fit for both parties. We wrapped the call by helping them see how easy it would be to make the changes that would make for dramatic improvements. We explained that the team and infrastructure they had in place would mean for a more rapid implementation of the strategy changes. Think about the trust we established in a single call that lasted less than an hour. Needless to say, they were eager to schedule a more in-depth consultation. Once again, consultative selling is as much about determining if the prospect is a good fit for you. If the connect call doesn’t leave you with the impression that the prospect is one that lines up with your organization, it may be wise to recommend them to another that may be able to handle their needs in a better way. If all goes well, and both parties find it in their best interest to speak further about the opportunity of working with one another, we want to conduct a second call in a similar process to the first. Move it along with the right questions, be helpful, provide value, and keep the pressure low. The second call, or “exploratory call,” gives us the opportunity to begin moving the conversation toward working together. You may have noticed we didn’t try to close the deal or ask about their marketing budget in the first call. In fact, we barely mentioned the idea of working together. The connect call is all about low-pressure conversation, where we take the opportunity to prove ourselves and build trust before moving the discussion toward logistics. While our whole consultative sales process is low pressure, by the time you reach the exploratory call we’ve established the grounds for a more serious conversation about how we best fit with their brand. Let’s take a look at our exploratory call with our fashion brand target as an example. Where the first consultative selling call maintained a surface-level discussion about how the brand can optimize their strategies, the second dives a little deeper. Some of the barriers that were initially in place have been lowered. The exploratory call is the perfect time to start discussing the best way for us to help their brand. This is where we can begin to discuss logistics. Once again, we only want to work with a brand if it’s a good fit for both parties. We don’t want to force ourselves into a situation where we don’t belong just for the sake of another contract. In our exploratory call with the fashion brand, we used the same strategy of leading the conversation with questions to get back into the groove we had established in the connect call. We kicked off by diving back into optimizing their content marketing strategy. Give yourselves at least a few days in between calls. It will give both parties time to review the items discussed in the connect call and outline a game plan for the exploratory call. Unanswered questions get answered and topics that got skipped over can be reopened and discussed in further detail. That’s exactly what happened in this second call. All of the analysis we had them doing in the connect call got the prospect thinking about the possibilities of a highly optimized content campaign. That meant that they were ready to have their questions answered right off the bat. Their questions were answered quickly and it was time for us to lead the conversation once again. We focused our discussion around their future state with our team as their partner, and we were able to determine one thing fairly quickly. One of the main reasons to hone your consultative selling skills is to gather all the information you can about the prospect. This brand was one that liked to conduct most of their operations in-house. They openly talked about having outsourced in the past and had reached a point where they felt they could bring each operation in-house. Rather than let this catch us off guard, we returned with a compliment. We agreed that it was smart to use an outsourced resource to handle operations and train their brand simultaneously until they felt they were producing at the same level (or better) than the outsourced resource could. We also shared that it was this type of outsourcing that had led Uhuru to experience such rapid success. Deal closer’s top tip:: It’s important to share any similar experiences you have with your target. We had used the same strategy to learn from experts and minimize our learning curve as we grew our agency into the powerhouse that it is today. Our willingness to reveal that information only served to bring us closer and establish a deeper connection with the brand. We had outsourced to get to where we are, and understood the brand’s reasoning for wanting to do the same. They shared that they’d had several departments outsourced at one time and “didn’t really like it,” so they eventually brought them all in-house. We explained that, while it didn’t necessarily fit the mold of how we normally help our clients, we were happy to make an exception because it was a move in a positive direction for our agency. Together we came up with the idea that, if we were to work together, Uhuru could handle their marketing strategy while creating a playbook for their team and training them along the way, and at a future date hand execution back to their in-house team. We choose clients based on a variety of factors, including the way our agency fits with a brand. While this wasn’t our traditional fit, it certainly wasn’t enough to throw us off. Instead, this brand represented an opportunity to expand our abilities and provide training on a scale we had yet to participate in. The consultative selling conversation continued to evolve, but we used leading questions to keep the direction focused around the subjects that needed further clarification. These questions are the pillars of our consultative sales process. They provide access to extremely valuable information and allow for powerful insights to be made on how to proceed. We asked about how the brand first transitioned into ecommerce, whether they had done it slowly as they were able or if they had put more resources behind it to speed up the process. The goal behind questions like this remind them of how they were able to achieve their current level of success in their other business systems. We followed up by asking questions about their outlook for the future, and then by asking them to ask us any questions on topics they were curious about. This invitation allowed them to ask about our position on CRM platforms, what we used, and how we might be able to help them make the most of HubSpot. We spent all the time we needed answering questions that helped our target understand more about who we were, our level of experience, and how a team with greater skills and proven success in digital marketing could help them. During each of our consultative selling calls, the Uhuru team focused on delivering plenty of high-quality, fully actionable advice. Our target could have taken all of it and walked away in much better shape than when we started, and that’s the point. At Uhuru we leave people better than we found them, for several reasons. One is that people trust and like us a whole lot more when we’re offering plenty of high-value strategy boosters without them ever needing to sign a contract. Next, we leveled up from tactics and detailed several strategy optimizations that gave them a chance to taste the level of expertise they would be working with if we were to close the deal. We avoided boring them with too much information, but were happy to supply them with more detail when they asked for it. Keeping our best advice behind closed doors only works to make us look secretive and, dare I say, greedy? We had handled the serious talk about our potential work relationship, so it was time to reinforce our position as the helpful experts that would make their jobs easier and their company more profitable. It was time to give them the lowdown on exactly what we would be doing if they hired Uhuru to handle their marketing. We asked for their permission to access their analytics, Facebook Business Manager, and HubSpot. Our next call was scheduled for about a week later, giving everyone time to digest what had been discussed and allowing us to run a more detailed diagnostic of their current strategies, at no cost or obligation to the brand. Through this call we were able to determine our role as a means to an end. We would help them reach a level of operations that allowed them to eventually employ an in-house team that could take over. At this point, neither party was sure exactly what the final outcome would be, but we were both able to be upfront about our expectations. This transparency allows us to structure our consultative selling approach according to the brand’s needs and build trust with our prospect thanks to a new level of open and straightforward communication. Interestingly enough, the diagnostic call may be the least important call, from a learning standpoint. That said, if you skimmed the first two sections (connect and exploratory calls) thinking you could jump ahead to the end, go back and read them thoroughly! Without the information from those two sections we’d never make it to the diagnostic call, so learn that first. The diagnostic call is the point at which a deal would be made or we would go our separate ways. There will be cases where we may need more or less time to go through the consultation process, but this is the tried-and-true format that we know works extremely well and keeps us in the state of constant growth that we’ve been experiencing since our early years. Let’s look at what it takes for us to close the deal, or decide it’s in our best interest to shake hands and walk away. By the time we reached the diagnostic call, the prospective client was seriously considering working with us. That should be obvious at this point. That’s why we know it’s time to dive deep into their ongoing marketing efforts and tell them all we can about what we could improve and why. I’m talking everything. We put it all together into this big messy ball of necessary improvements, and then get to polishing. Well, the people we’re talking to are still human. They don’t want to hear that they’re doing a terrible job. They don’t want to be bored with minor details. They want to know about the pieces that could be improved that will have the most dramatic impact on their bottom line. They need to understand how each of the things we recommend will impact their company in both the short and long terms. We leave out the little things. We don’t include every little tidbit that sticks out to us just because it’s there. At least not at first. It’s nice to have that little nitpicky stuff tucked up our sleeves in the event that the conversation goes deep into a specific component of their strategy. Then, and only then, is it useful. Otherwise, we focus on the key points that will have the most impact and make the most sense to the people we’re talking to. Deal closer’s top tip: Know your audience. The person you’re speaking with should have a major influence on the way you structure your dialogue. For instance, if you’re talking to the head of marketing, you’ll probably be able to go into more detail about strategy and flex your marketing vocabulary. If you’re talking to the COO of a company with limited marketing experience, you’ll want to keep your marketing language simple and straightforward and speak in a way that appeals to concepts that are important to their role. Don’t forget whom you’re talking to! The most important part of the diagnostic call is demonstrating how we fit into the growth puzzle. We can sit around talking about what needs to be improved all day long, but it won’t do any good unless our target understands how we’re going to make their life easier and deliver on our promise to optimize their marketing strategy. During this final call, our focus is on the core concepts that we’ve been discussing throughout the series of calls. The prospect’s main concerns won’t have gone anywhere and it doesn’t make sense to talk about tactics beyond the scope of their current understanding at this point. How do we determine those core concerns? Simply put, we ask! After all, that’s what consultative selling is all about. We had given a lot of information away for free and covered a ton of strategy enhancement opportunities that most experts would charge for. After all of this, the best way to make sure we’re targeting the right points was to ask the brand. Once we knew what was important to them, what they needed to hear, we could share our strengths. Few feel it’s important to focus on our strengths. We play our best cards first and like to think we wow them with our expertise. We do not go overboard, as we run the risk of going too far off topic and boring our audience. This is the call where we get to show examples, where we take it to a higher level and screen share. That way we can show the prospect exactly what we’re talking about. The better they understand, the more likely we’re able to get our point across and close the deal. As we understood the fashion brand’s interest in Facebook’s ability to boost sales immediately, we took our target through a highly detailed outline of how we would improve their Facebook Ads strategy. We didn’t give them the exact formula we use to make Facebook powerful, but we took them through and showed them how they could improve and why we would do those things. This was what mattered most to them, so it’s what we focused on. By the time we got to the end of our call, we were all ready to see where we were headed. The problem was that we hadn’t reached a point where we could make that decision. They were ready for a pitch, but they weren’t entirely sure what they were ready to hire us for. We created this resource to provide an insight into what we believe is a highly effective consultation process. The details pertaining to Uhuru, our prospective client, and even the outcome of the process should be of little concern to you. What we want you to focus on is the consultative selling process. How we got from the first call to the third. How we turned a skeptical brand into a supportive believer who wanted to partner with us. For prospective clients, we wanted to detail our process to be perfectly transparent and allow them to understand how we work and what they can expect from our free consultation or even out outbound sales process. Everything we detailed in the three phone calls, all the research, suggestions, analysis of their Facebook, analytics, etc., is all free. 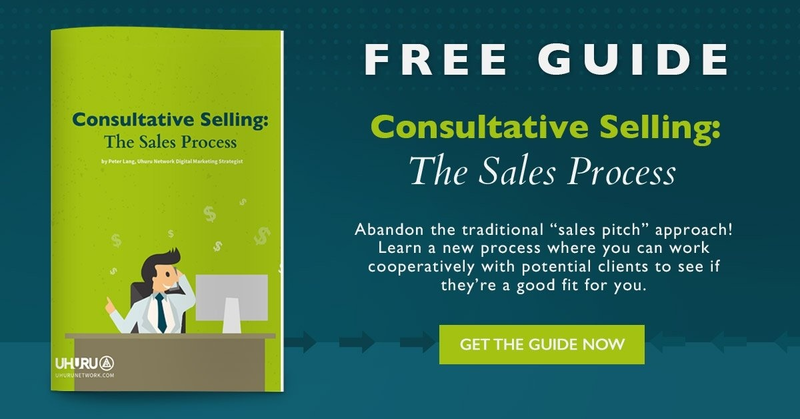 What this three-stage consultative selling process does is give us a chance to prove ourselves, to bring value to a prospective client, and to analyze whether or not we can work with and help someone take their business to another level. You can’t put a price on that, in our estimation. If you are looking to this for advice and ideas on how to do things yourself, I encourage you to give it a second (or third) read in order to get everything out of it. Remove the specifics and put yourself in our position. Walk your way through the entire process and play out the various scenarios. What questions would you ask? How would you respond to their inquiries? If you take a step back, you’ll notice that each call has a definitive theme that differentiates it from the others. The connect call was all about getting familiar with one another. Do we like each other enough to work together? Does Uhuru have what it takes to help them reach their goals? Does this brand represent what we want in our client? The exploratory call changes things up and focuses on how we would go about working together in a hypothetical ecosystem. What would working together look like? What can we expect from this relationship? Can we come up with a win/win plan that makes both parties happy? By the time you get to the diagnostic call, both parties have reached a place where they know each other, like each other, and have come up with a plan to work together to achieve the desired growth goals that works well for both sides. Now it’s all about details. Can we provide enough value to the prospect with the strategies we are suggesting? Is it in both parties’ best interests to proceed into a business relationship? We believe that abandoning a traditional sales approach for our three-stage consultative selling approach is a good fit for us and for our clients. We’ve had success with it over and over again. We enjoy the cooperative relationship we form over the course of the phone calls, and it is clear to us at the end of the process whether or not we can move forward with a prospect. We hope this transparency and the information within the consultative selling process is helpful to you and your business successes. If this has eased your concerns about reaching out, please feel free to get started by scheduling a strategy session.